The world of Baten Kaitos exists in an era where lands float in the sky and the once-vast oceans are mere legend. With your help, Kalas and Xelha must struggle to reveal the mystery of the lost ocean and destroy the corruption that threatens their world. • Embark upon an emotional journey across a richly imagined world and detailed character development spanning over 60 hours of gameplay. • Vivid, pre-rendered backgrounds are alive with subtle, ambient animations. Enjoy gloriously rendered battle environments and astounding spell effects. • An unconventional card-based RPG system unites all elements of gameplay with over 1000 types of “Magnus” cards. 01-28-2019 silverbow Box Text "It's possibly the most beautiful GCN title ever made" ? 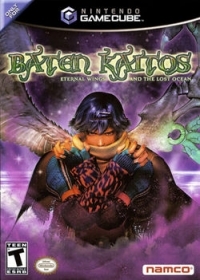 Nintendo Power The world of Baten Kaitos exists in an era where lands float in the sky and the once-vast oceans are mere legend. With your help, Kalas and Xelha must struggle to reveal the mystery of the lost ocean and destroy the corruption that threatens their world. • Embark upon an emotional journey across a richly imagined world and detailed character development spanning over 60 hours of gameplay. • Vivid, pre-rendered backgrounds are alive with subtle, ambient animations. Enjoy gloriously rendered battle environments and astounding spell effects. • An unconventional card-based RPG system unites all elements of gameplay with over 1000 types of “Magnus” cards. 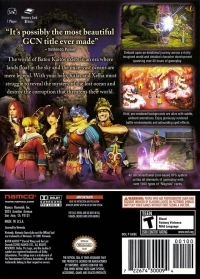 05-14-2014 heavengeance Box Text "It's Possibly The Most Beautiful GCN Title Ever Made" -Nintendo Power The world of Baten Kaitos exists in an era where lands float in the sky and the once-vast oceans are mere legend. With your help, Kalas and Xelha must struggle to reveal the mystery of the lost ocean and destroy the corruption that threatens their world. 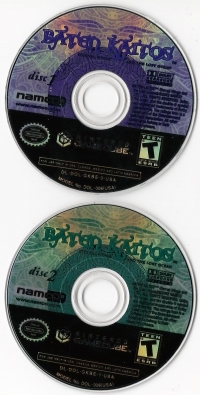 05-12-2012 disgaeniac Box Text "It's Possibly The Most Beautiful GCN Title Ever Made" -Nintendo Power The world of Baten Kaitos exists in an era where lands float in the sky and the once-vast oceans are mere legend. With your help, Kalas and Xelha must struggle to reveal the mystery of the lost ocean and destroy the corruption that threatens their world. This is a list of VGCollect users who have Baten Kaitos: Eternal Wings and the Lost Ocean in their Collection. This is a list of VGCollect users who have Baten Kaitos: Eternal Wings and the Lost Ocean in their Sell List. This is a list of VGCollect users who have Baten Kaitos: Eternal Wings and the Lost Ocean in their Wish List.